Light through Stained-Glass Windows: Is the movie as good as the book? Our humble medium-sized county library system holds a fabulous collection of materials. One of those collections is its movies (both from theater films and TV). To that end I "found" a treasure that I had missed entirely. I subsequently read that this film had been released on Canadian TV and I don't think it has been shown in the USA....yet. It's the first book of Louise Penny's marvelous mysteries starring the brilliant detective Armand Gamache and his adventures in the little village in eastern Quebec, Three Pines. 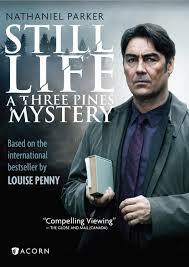 The first book, and hopefully only the first of many films, is Still Life. Two or three trailers are available on youtube, so you can get a good idea of what the 90-minute film offers. It's wonderful and, yes, it is as good as the book....well, almost!